A new U.S. Spectrum Policy Team has been formed to accelerate spectrum sharing policies and technologies. President Obama has ordered this Spectrum Policy Team to draft recommendations on how NTIA and FCC can incorporate spectrum sharing into their spectrum management practices to enable more productive uses of spectrum throughout our economy and society and protect the current and future mission capabilities of federal agencies. The team consists of the Chief Technology Officer and the Director of the National Economic Council, along with representatives from the Office of Management and Budget (OMB), the National Security Staff, and the Council of Economic Advisers. The NTIA is directed to publish an inventory and description of Federal test facilities available to commercial and other stakeholders engaged in research, development, testing, and evaluation of technologies to enhance spectrum sharing and other spectrum-related efficiencies. The new memo comes three years after a similar Presidential Memorandum instructing the Secretary of Commerce, working through the National Telecommunications and Information Administration (NTIA), to collaborate with the FCC to make 500 MHz of Federal and nonfederal spectrum available for wireless broadband use within 10 years. FCC Commissioner Jessica Rosenworcel stated: "We are on a hunt for new opportunities for commercial spectrum to reach the 500 megahertz benchmark for new wireless broadband use in the Executive Order from the President nearly three years ago. Our traditional three-step process for reallocating federal spectrum--clearing federal users, relocating them, and then auctioning the cleared spectrum for new use--is reaching its limits. That is why since my first days in office I have endorsed building our federal spectrum policy on carrots, not sticks. Verizon: "Further exploring ways for federal government-spectrum users to more efficiently use spectrum they have been assigned, as well as for developing appropriate sharing between commercial- and government-spectrum users, should bring much needed wireless spectrum to the consumer marketplace. Verizon Wireless has invested in efforts to study how sharing in certain bands of spectrum might take place. These are worthy efforts that should continue, and we are committed to this ongoing work with the administration, Congress and other players in the wireless market. It is critical, however, that the important work being done to identify and clear government spectrum for auction continue, and we are encouraged that the president has recognized that this effort is important. We thank the administration for laying out a clear path that will help bring more spectrum to consumers of wireless services, where it will allow the U.S. to maintain its global leadership position in wireless innovation." 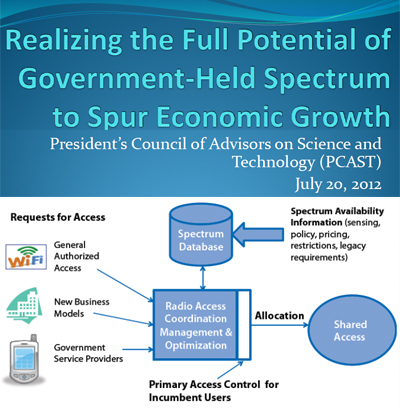 In July 2012, the President’s Council of Advisors on Science and Technology (PCAST) issued a report identifying 1,000 MHz of federal spectrum for sharing with the private sector. A Presidential memorandum issued in June 2010 requires that 500 MHz of spectrum to be made available for commercial use within 10 years. However, a recent NTIA Study found that clearing just one 95 MHz band will take 10 years, cost $18 billion, and cause significant disruption. Moreover, the net revenue for the Treasury from the last successful auction of 45 MHz realized a net income of just a few hundred million a year ($5.3 billion total). The PCAST report said its vision of shared spectrum is viable using existing technologies and is not dependent on cognitive or "smart" radios. Instead, a geo-location database could be used the share spectrum much like how the FCC is using managing TV bands. The TV Whitespaces system could be used as a model. Technical standards would need to be implemented for coexistence of transmitters and receivers to enable flexible sharing. To get things rolling, the PCAST report recommends that an incentive mechanism be created to encourage Federal agencies to begin sharing (e.g., Spectrum Currency). The existing Spectrum Relocation Fund, which is supposed to fund the migration of federal users out of certain bands, could be redeveloped into a "Spectrum Efficiency Fund." The system could be tested in a specific city before being extended nationwide. Google introduced Project Loon, one of its "moonshot" initiatives to transform the world with breakthrough technology. Project Loon's aim is to deliver Internet access to "all the world's people" including remote locations on every continent. The project is experimental and still in its early days. Project Loon will use free flying balloons at high altitudes to beam Internet access to the ground at 3G speeds or faster. The concept will require a very large fleet of balloons and complex algorithms to ensure continuous coverage as the balloons drift around the planet. Project Loon will launch and manage a network of high-altitude balloons operating at about 20,000m elevation. Balloons communicate with neighboring balloons as well as to stations on the ground. Each balloon will be about 15m in diameter. Google will steer the ballons by using solar power to control the altitude. Bands of balloons will circle around the globe at various latitudes. Google will use specialized antennas on the ground to pick up the signal. Google launched 30 balloons this week from the New Zealand as a test. Google said it can direct the balloons to land and hopes to retrieve and reuse the balloons when possible. Rich DeVaul is Chief Technical Architect of Project Loon. Mike Cassidy is Project Lead.